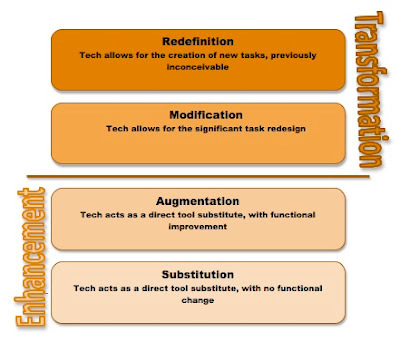 Lateacha: What is the SAMR Model? A brilliant model to consider where you are at with implementing ICT and a blended e learning approach in your classroom. I found that I operate in all levels depending on the task and purpose. How does it reflect your teaching approach to technology? As usual there are many briliiant brains that sit behind the development and implementation of this model. To investigate further I highly recommend reading the information at the link below. Valuable ideas about how these levels are used and how this model came about. Worth reading! !